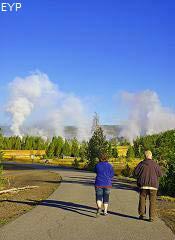 Visitors eagerly awaiting another Old Faithful Geyser eruption in Yellowstone National Park. 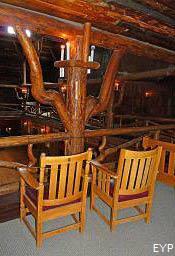 Dave's parents spent their honeymoon in the Old Faithful Inn, and it's nearly overwhelming to think of all the generations who have walked its floors and have watched Old Faithful Geyser erupt from the deck of Old Faithful Inn. The memories run very deep here, and all of us are very fortunate to have such a spiritual and magical place to keep coming back to, year after year. This special place remains unchanged, and it's something we can always count on in this ever-changing world. 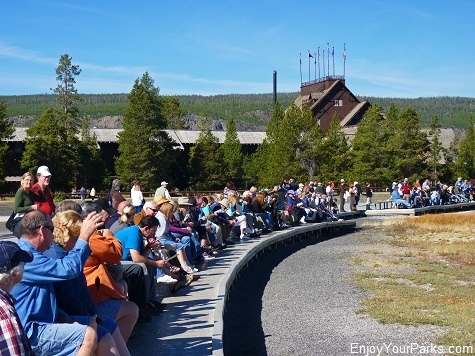 There are six main attractions in the Old Faithful Area in Yellowstone National Park that we will discuss in this section, which are Old Faithful Geyser, Old Faithful Inn, Old Faithful Lodge, Upper Geyser Basin, and the New Visitor Center and "Geyser Row". 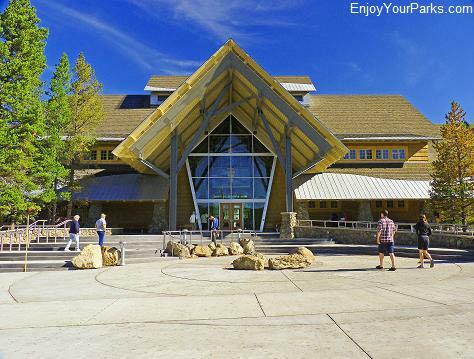 Of course there are several more incredible attractions here such as the Snow Lodge and the Old Faithful General Store and Gift Shop, and once you get here, you'll definitely need some time to explore it all. 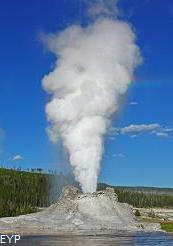 If you had to pick the most classic image of Yellowstone Park, most people would have to say it's Old Faithful Geyser. 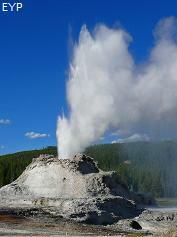 Bringing the family to watch Old Faithful erupt is one of the most "American" things a person can do, just as taking your family to a baseball game on a warm summer day and having a hotdog. 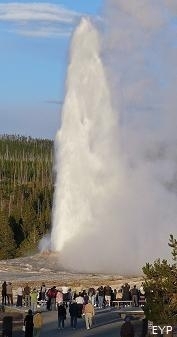 And we must admit, even though we've watched Old Faithful Geyser erupt hundreds of times, we never get tired of it. It's "OUR CONSTANT" in this crazy, hectic world. 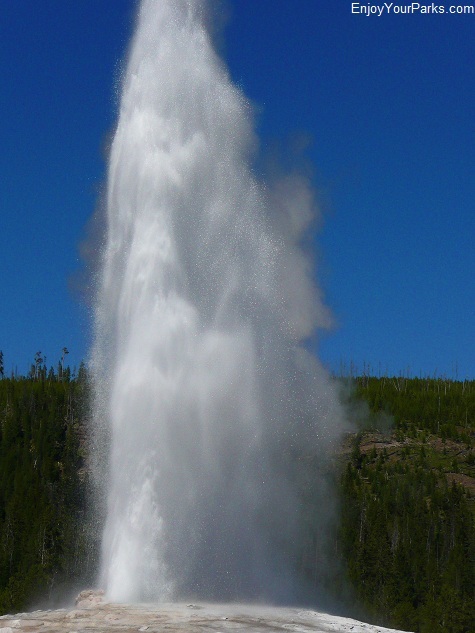 Old Faithful Geyser erupts about every 90 minutes, give or take 10 minutes, and it's height ranges from 106 feet to 185 feet. 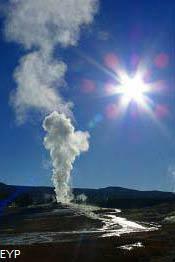 The eruption lasts from 1.5 to 5 minutes, and anywhere from 4,000 to 8,000 gallons of boiling water is thrown into the air! 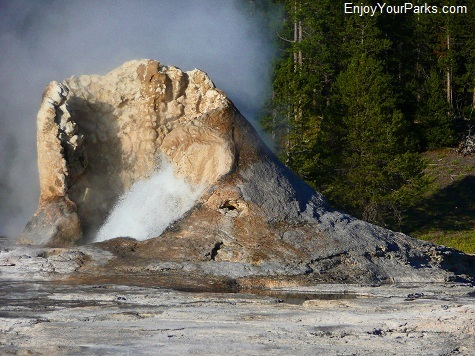 It's truly a sight to see, and you'll NEVER forget the first time you watch it go off! 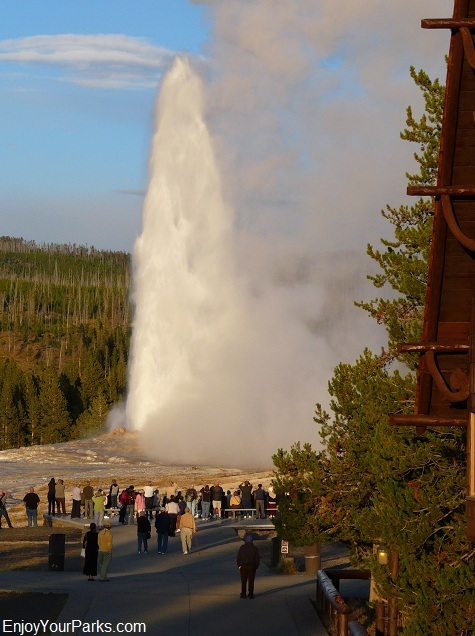 Old Faithful Geyser is one of the most popular attractions in Yellowstone National Park, and once you see it, you'll understand why. 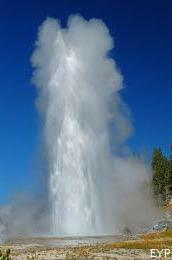 Old Faithful Geyser, Yellowstone National Park. 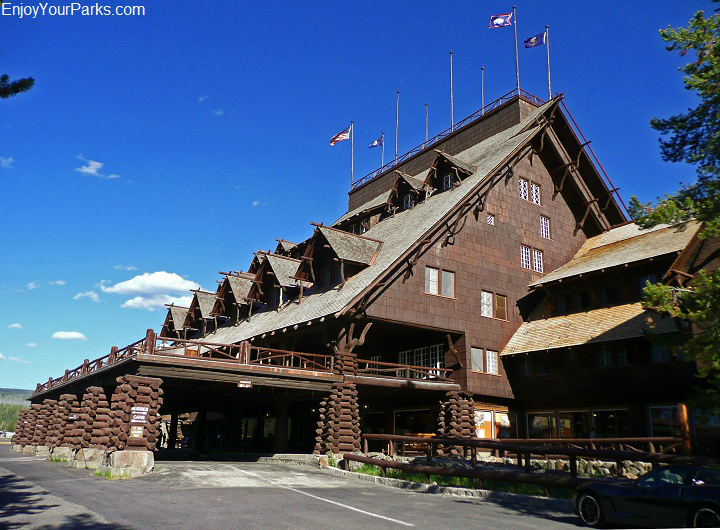 The Old Faithful Inn in Yellowstone National Park is truly a National Treasure, and one of America's favorite buildings! Once in awhile, a human being does something "beyond human", such as Beethoven's Ninth Symphony, or Michelangelo's Sistine Chapel. 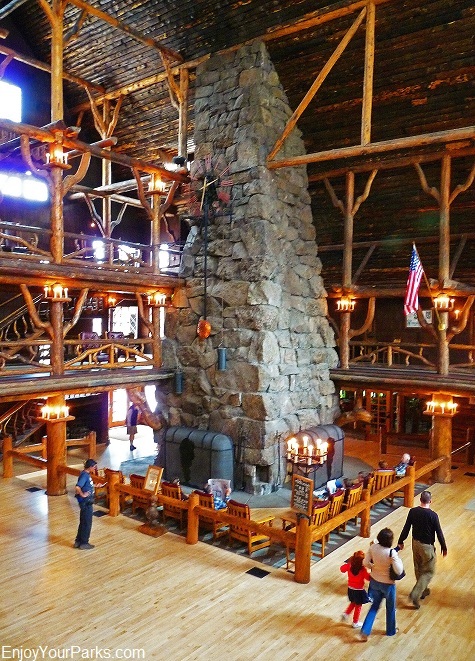 Well, many people agree that Robert Reamer at the age of 29, accomplished something "beyond human" when he designed and built the Old Faithful Inn. This timeless work of art is a world famous architectural masterpiece. 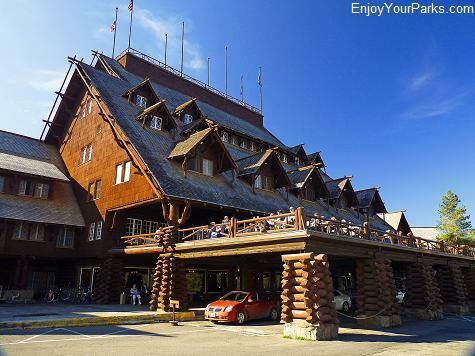 Old Faithful Inn was built in the winter of 1903-1904, and it is one of the few log hotels still standing in the United States. 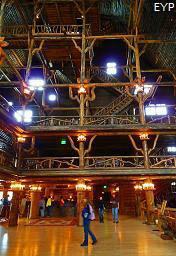 In fact, it's the largest log structure in the entire world! 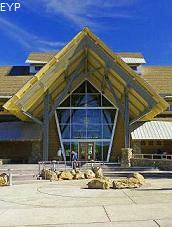 All of the materials used to build this incredible structure was from the surrounding landscape. 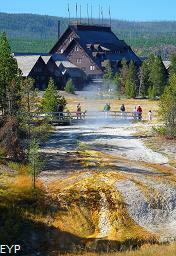 The two main ingredients are Lodgepole Pine and Rhyolite Stone. 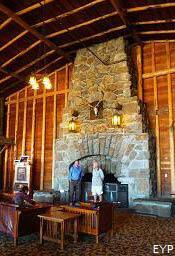 One of the most memorable features of the great lobby is the monstrous stone fireplace. 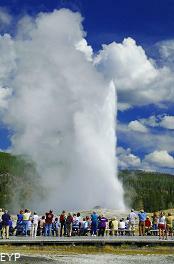 Weighing 500 tons and reaching a height of 85 feet, it's nearly as spectacular as Old Faithful Geyser!!! 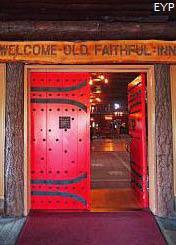 Millions of people enter Old Faithful Inn's great red doors every year, and is greatly enjoyed by all who visit it. 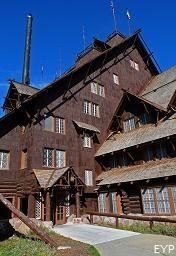 In 2007 a national survey conducted by the American Institute of Architects found that the Old Faithful Inn was voted one of America's Favorite Buildings. 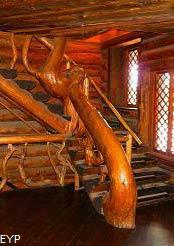 It's truly one of America's prized possessions, and is designated a National Historic Landmark. 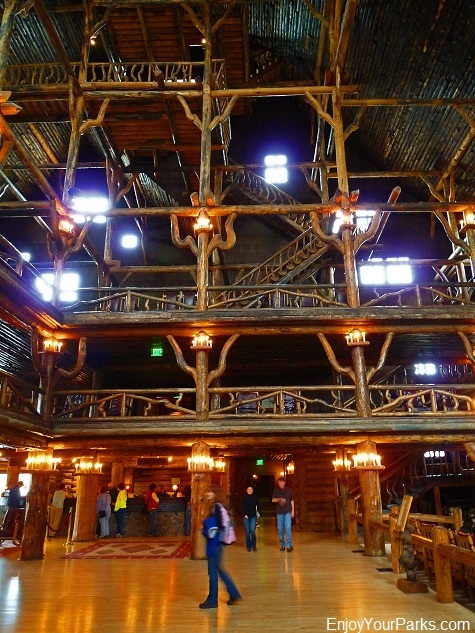 It's beauty and mystique is hard to put into words, but once you walk into this unbelievable building, Old Faithful Inn will become a part of you for the rest of your life. 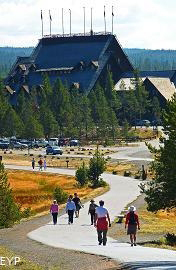 Old Faithful Inn in Yellowstone National Park is one of America's Favorite Buildings according to a survey by the Amercan Institute of Architects. 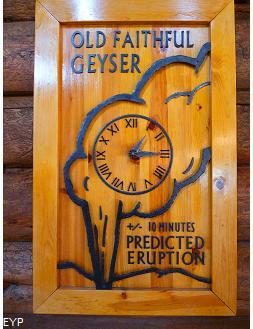 If you have the time, make sure to not only visit the Old Faithful Inn during daylight hours, but if at all possible, visit it again when the sun goes down. 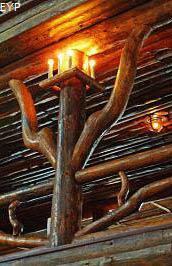 The lighting in this great structure at night is incredible and charming, and is truly worth the time to take a look. You'll be glad you did! 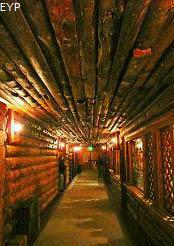 If you have the time, and you're interested in the history of Old Faithful Inn, several times they offer a 45 minute tour of the Inn! 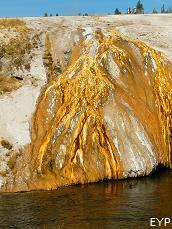 It's EXTREMELY fascinating and interesting, and we feel it's well worth the time. 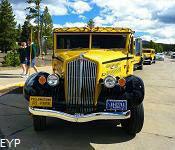 But then again, we are history buffs so we love that kind of thing. 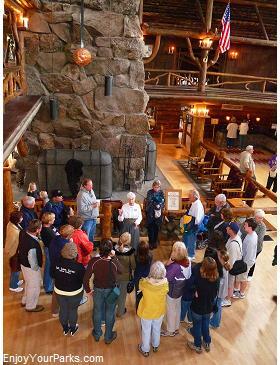 A very knowledgeable tour guide will walk you through the history of this national treasure, and will take you to several different locations throughout the building. The information they share with you is absolutely fascinating. 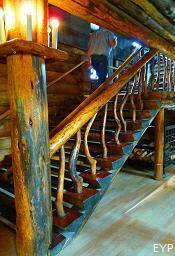 In fact, we've been on many of these tours, and we are completely fascinated every single time. 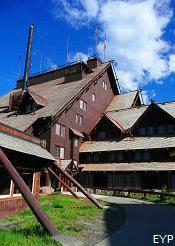 Again, if you are interested in the history of Old Faithful Inn in Yellowstone National Park, this is a "Must Do". 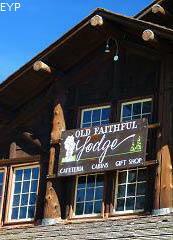 Built in 1923, the Old Faithful Lodge is a lodgepole log structure, and is another notable attraction in the Old Faithful Area. 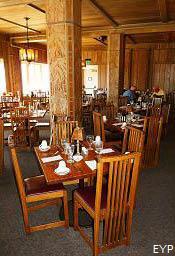 It has a very nice cafeteria, as well as a wonderful gift shop and grand room which faces Old Faithful Geyser. 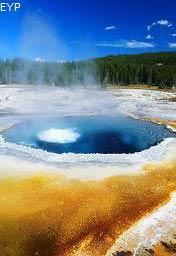 And if you're allowed, try to take a peek at the "Geyser Hall". 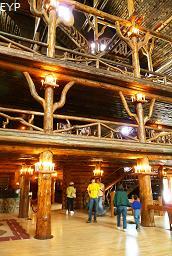 It's really spacious and quite remarkable. 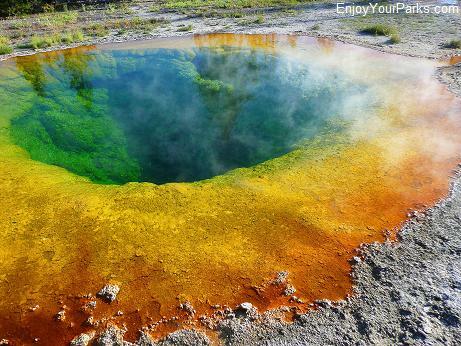 This is the famous Morning Glory Pool, which is located in the Upper Geyser Basin. 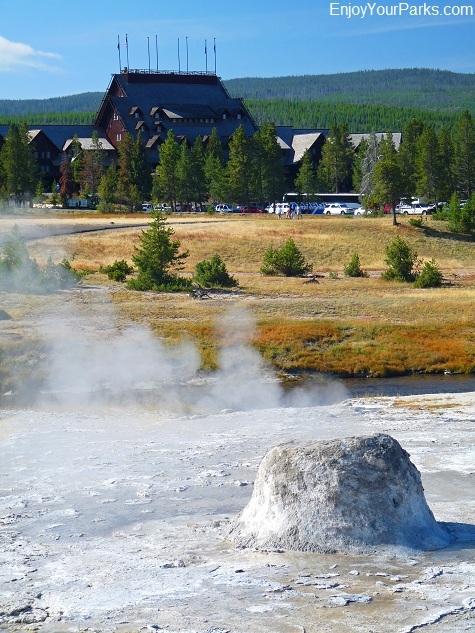 Directly in front of Old Faithful Inn is the legendary Upper Geyser Basin, which is home to many other geysers in addition to Old Faithful Geyser, such as Grand Geyser, Castle Geyser, the Grotto, Riverside Geyser and Morning Glory Pool. 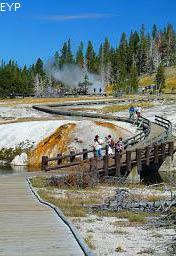 We STRONGLY recommend that you take this walk around the Upper Geyser Basin in Yellowstone National Park- you will enjoy every step of the way! 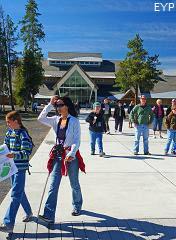 And remember to pick up a trail guide at the beginning of your walk- it's extremely informative and helpful. 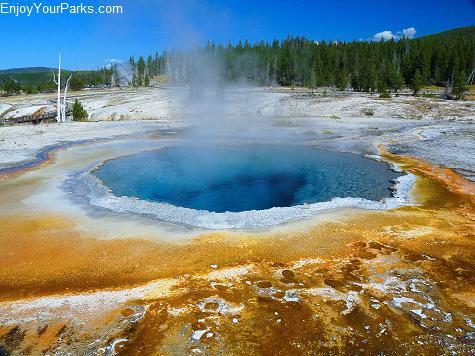 Upper Geyser Basin in Yellowstone National Park has a tremendous display geysers of all shapes and sizes. 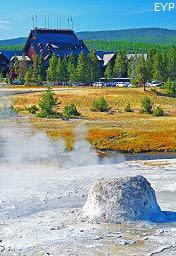 Beehive Geyser in the Upper Geyser Basin of the Old Faithful Area of Yellowstone National Park. 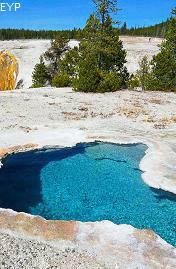 Crested Pool is one of the many hot springs found in the Upper Geyser Basin at the Old Faithful Area in Yellowstone National Park. 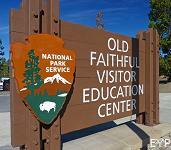 The new Old Faithful Visitor Education Center is a welcome addition to the Old Faithful Area in Yellowstone National Park. We usually don't like to see a lot of changes in the parks, but this "change" is really a good one and we are very impressed with what they did. 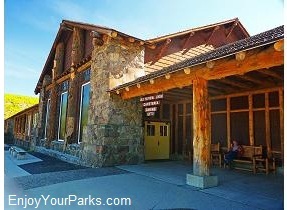 This brand new (2010) Old Faithful Visitor Education Center is very well done and extremely fascinating and educational. 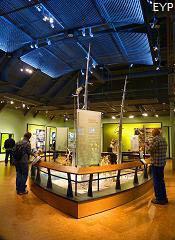 You'll certainly agree once you visit this fantastic visitor center. 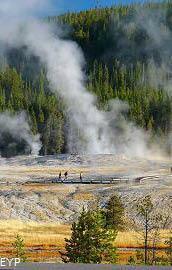 It's definitely a welcome new-comer to the Old Faithful Area in Yellowstone National Park. 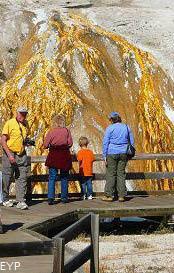 Geyser Row is a "Must See!" 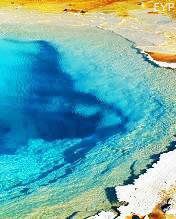 Geyser Row includes 4 world-renowned geyser basins in Yellowstone National Park, which are Black Sand, Biscuit, Midway and Lower Geyser Basin (click here). 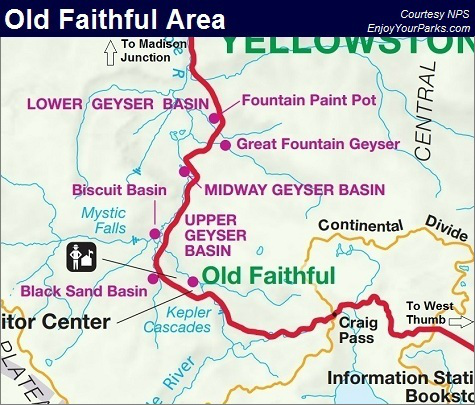 This astonishing cluster of hydrothermal features are part of the Old Faithful Area, but because it's so important for you to know about and learn about, we made a separate page for you to enjoy. 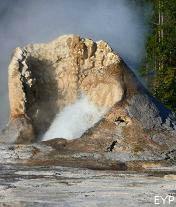 Geyser Row is less than two miles north of Old Faithful Inn in Yellowstone National Park, and it is home to some of the most awe-inspiring geysers in the world! 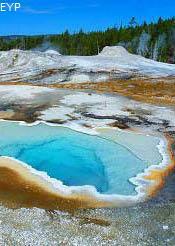 The Old Faithful Area is the heart of a Winter in Yellowstone. 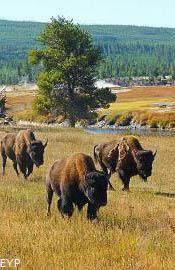 For More information on this incredible time of year in Yellowstone Park, click here. 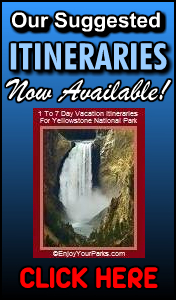 Make sure you check out our Informative E-Books which outline many Suggested Itineraries to help make your Yellowstone Park Vacation as enjoyable as possible.